It is a claypot where the name of the city of Calamba originated. Stands in the city plaza with the names of all the barangays of the city written in a map-like. The colour of Banga looks like a natural claypot. 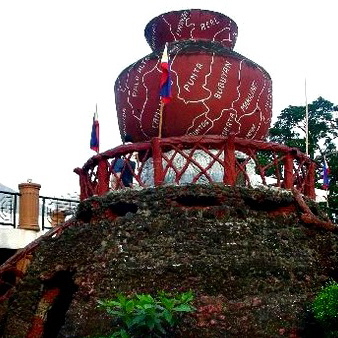 Banga in Calamba is considered the largest claypot in the world. 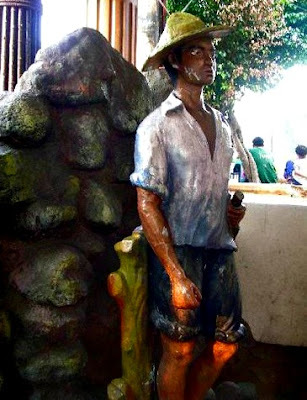 It is understandably so, because it is only in Calamba where you can find this unique work of art. So, come along with me, make your stay in Calamba memorable. Take some steps up to the Banga and have some pictures taken. 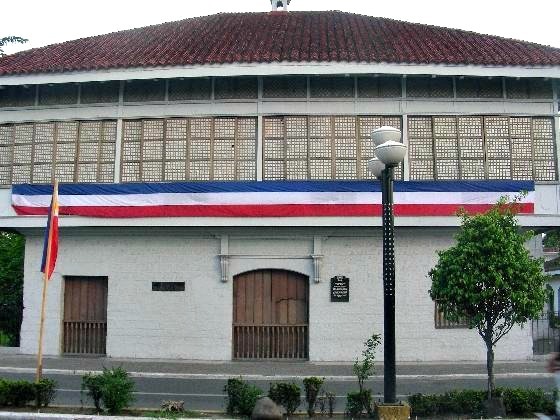 After visiting this attraction, you may go walk few steps to the house of Dr. Jose P. Rizal, the Philippines' national hero. It is adjacent to the site of Banga. Directions: As soon as you arrive in Calamba from Manila, turn left to the town plaza. You won't miss it. It will take around 7 minutes. This is the home where Dr. Jose P. Rizal and his family were raised. It is now turned into a shrine welcoming local and foreign visitors. The entrance is free as far as I can remember. Visiting this 2-storey Spanish-style vintage house will give you an idea on how Dr. Jose Rizal lived. It stands on a big lawn with old century trees. You will see memorabilia of his childhood from the pictures and sculptures he made. You will learn about his written works and see the pictures of women in his life. 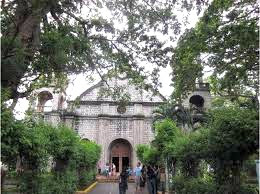 There is a lot more to see but I will leave the rest of the information when you come visit Dr. Rizal's house. You may give donations if you are willing to help maintain the shrine. The museum is open from 8:00AM to 12:00Noon and 1:00PM to 5:00PM everyday. Closed on Monday. Directions: You won't miss it. As soon as you arrive in the city, turn left headed to the city proper. The house is adjacent to the other tourist attraction, "Banga" or "Claypot". Just down under the Banga in Calamba, you will find two statue depicting the native people of Calamba on those olden days. The man is dressed as a farmer and the woman is a housewife going to a water well to get drinking water. You will see the small or the normal size of a Banga or Claypot that was used by Calamba local people during the Spanish regime. These days, banga is rarely used. You will see Banga in some houses as a decor. Come visit this site and take pictures. You will not see this in other place. Directions: As soon as you arrive in Calamba from Manila, turn left headed to the town plaza. It will take only approximately 7 minutes. Situated at the major intersection of Calamba city proper. You can shop for stuff from automotive items, home and office, parties and gifts, beauty, health & fitness, clothing & fashion, and grocery items. I bought a dozen of shirts in this shopping mall. Clothes are cheap and of good quality and style. You can also have your lunch and dinner within the mall. Choose between Italian, American, Chinese, Japanese, and the local Filipino dishes and desserts. Directions: As soon as you arrive in Calamba major intersection from Manila, turn right and you will see to your left the big signage. I was in Calamba recently and noticed that it is progressing over the years. Most of the fastfood restaurants are in the city centre. Find McDonalds and the local Jollibee at the major intersection or widely known as Crossing of Calamba. The popular Burger King and Goto King are also at its best. Both are few minutes away from Crossing. Calamba was made popular with an array of natural hot spring resorts. It is known all over the Philippines that the best hot springs can be found in this city. Most of these resorts provide a very relaxing ambiance. Some of the popular resorts are: Cayets Cabin, Agua Caliente, Rockpoint Hotspring Resort & Hotel, Mountain Peak Resort. Moving around Calamba and its neighbouring towns is easy. Tricycles are commonly used by the local people for short distances or within the city. You can commute by bus or jeepney to travel to other parts of the province of Laguna, like, Los Banos, Bay, San Pablo City, Santa Cruz, Pagsanjan and Siniloan. Have a good time in Calamba. It is a safe place to have fun.